The Algarve, is not only blessed with over sixty blue flag beaches, numerous golf courses, vibrant nightlife, glorious weather but also a host of other activities visitors to the area may not always be aware of. When booking hotels and flights for your trip to the Algarve, there are several helpful websites, such as First Choice. It couldn’t be easier! Here are my six hot tips. Stand UP Paddle Boarding is a cross between surfing and canoeing. The SUP board is similar to a standard surfboard and the paddle, similar to that of a canoe. 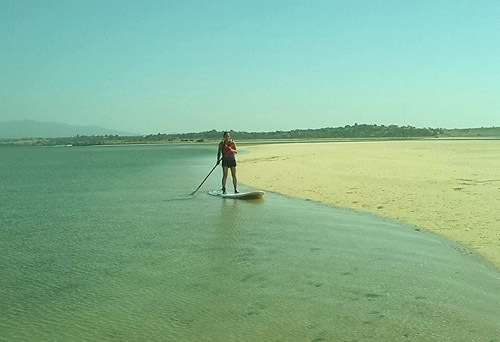 You can paddle board on flat waters, such as Alvor lagoon, or in open water and surfing the waves. When I contacted Lagos SUP School for more information, my first question was: Is there an age limit? 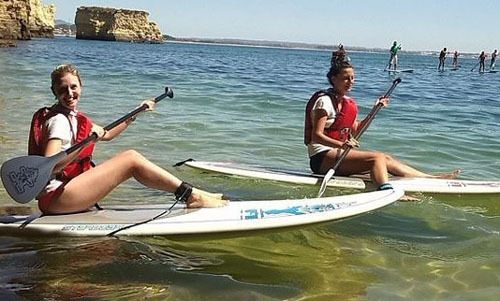 Beginners are advised to start in a quiet place without waves such as Alvor lagoon. 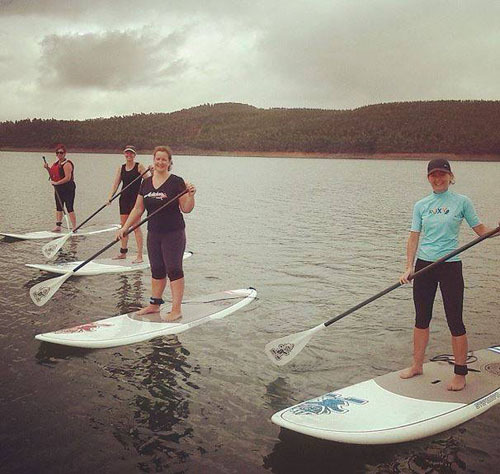 SUP is easy and great fun, why not try it? 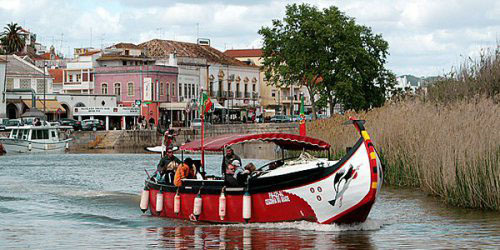 Looking for something different – why not take a boat trip up the Arcade river from Portimão to Silves? Please note: the trip to Silves is tide dependent, so do telephone first to check the time of departure. If you are looking for a ‘something different’, then I suggest you look no further than a creative writing weekend organised by award winning author, Anne Aylor. The two day workshop is held at The Holiday Inn, a beautiful hotel in a stunning location right on the beach. Regardless of whether you are a complete beginner or a published author, the workshop is great fun and almost a retreat as you ‘connect’ with your creative side. 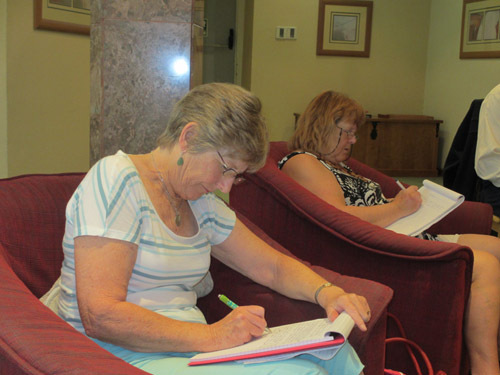 I have now attended two of Anne’s workshops at the Holiday Inn, and have thoroughly enjoyed them! 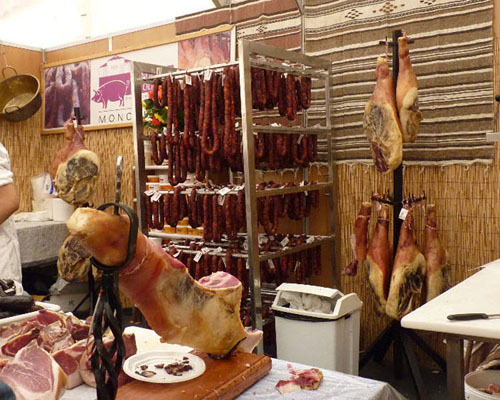 The sausage fair is held on the first weekend of March in the mountain town of Monchique. Situated in the Serra de Monchique the area is not only famous for it’s locally produced products, but also for the thermal spas at Caldas de Monchique. The area was also put under the spotlight when Prime Minister David Cameron enjoyed his two week family holiday in 2013. 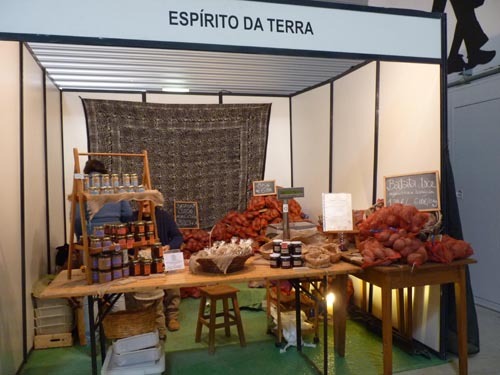 The fair, a two-day event, is a great opportunity to sample the famous Monchique sausage, cured hams, locally produced medronho (fire water), fig liqueur, and delicious homemade cakes! There is also live music and other entertainment throughout the day and late into the night. There are plenty of local restaurants serving traditional Portuguese food, so before visiting the fair you might even want to continue your journey up the mountain to take in the panoramic views from Foia which is 902metres above sea level. On a clear day, the panoramic views from Faro in the east to Cape Vincent in the west are fantastic! 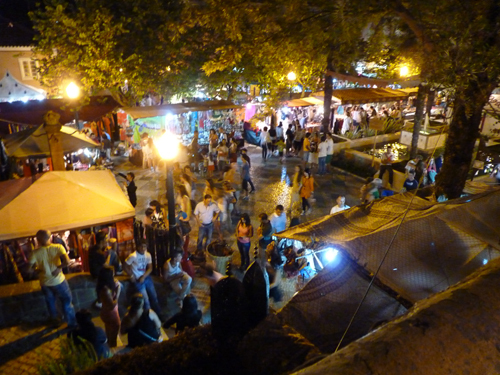 The fair is held in the Heliporto Municipal, Monchique. There is onstreet parking and easy access. For more information check the local website, which incidentally does translate well if you use the ‘Google translate option’. If not, your resort Tourist Information Office should be able to access the information for you. 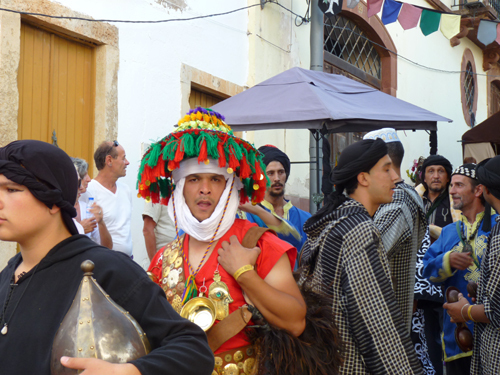 For anyone on holiday during the second week of August, the Silves Medieval Fair should be included in your itinerary. 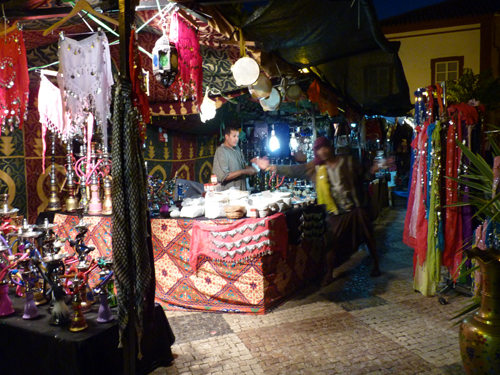 The ancient, and winding streets of the Moorish town of Silves are lined with stalls selling tempting food, crafts and other interesting sundries. Tips: Don’t eat before you go because there are numerous stalls where you can buy food and then sit on straw bales to soak in the ambience. When you order Sangria, it is served in a rustic terracotta mug. You are charged for the mug but then it is yours to keep and replenish with Sangria at the various stalls as you wander round the streets. There are street entertainers, music and even a jousting event which is well worth a visit, especially if your feet ache and you need to recharge your batteries! If you really want to sample the ‘Medieval Experience’, you can hire costumes. Adults €3.00 and Children €2.00. Although from personal experience the temperature in Silves often exceeds 30C so take this into consideration before hiring. It’s hot! I also recommend good non-slip footwear as the cobbled streets are VERY slippery. 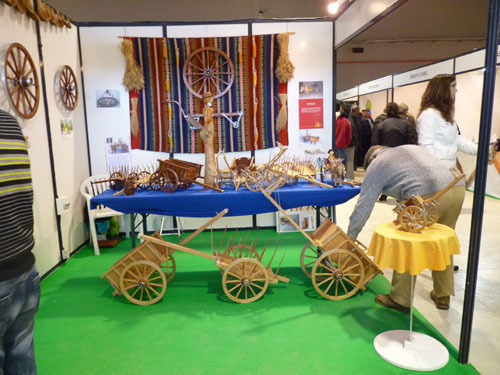 Entrance fee to the fair is only €2.00. No charge for children under 1.3 metres. There is some disabled parking but you will need to arrive early (17.30). If you are on holiday during the last weekend of November and looking for a day out away from the beaten tourist track of the Algarve, why not venture up to the Moorish town of Aljezur to experience the Sweet Potato Festival? The event is held in the Espaço Multiuso de Aljezur and is well signposted. 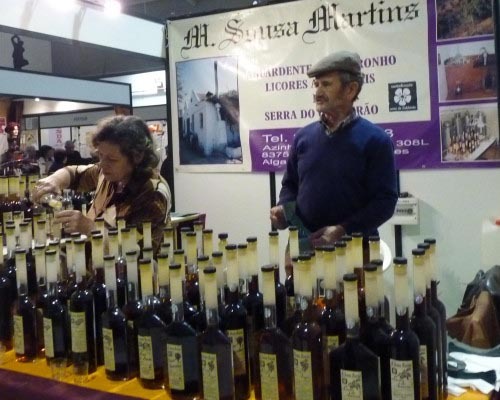 Sample the local liqueurs – they are delicious! I can highly recommend fig and almond. Did you know you can even buy liquors made from sweet potatoes? No neither did I! Better still, try some sweet potato cakes! Website: cm-aljezur.pt or your local resort tourist information should have the details. 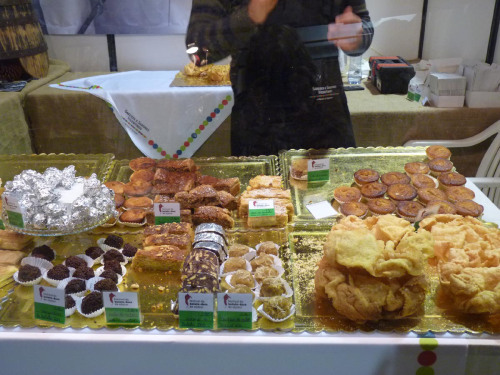 Sweet Potato Festival – Festival da Batata-Doce de Aljezur. Excellent blog PiP. Unfortunately we return to the UK a couple of days before the Aljezur Sweet Potato Festival which I’m dying to visit. Excellent 🙂 Can I tempt you to try the paddle boarding? Fun collection! I tried paddle boarding last year at Oscar Scherer Park . . . next to signs warning of ALLIGATORS. Knowing what might be lurking below the surface, helped me maintain my balance. At least we don’t have alligators in Portugal! Can’t believe you did that! Forget the paddle boarding, I’ll go for the River Cruise! Great post Carole, very informative. Ah, so we can’t tempt you? Great fun post I have filed for later study which includes heaps of envy 🙂 ! Most of this is not necessarily in tourist books!! All very interesting as long as paddle boarding is set aside: could not do the rest from a hospital bed!!!!! Interesting activities. Had never heard of the Sweet Potato Festival, didn’t know either that sweet potato was eaten in Portugal…maybe it wasn’t in the part of the country I was in. Have a wonderful Christmas Carole and may 2015 bring you health and peace.